One of the most popular destinations in Boston for both tourists and residents is the Boston Common, also known as the oldest public park in America, founded in 1634. The 50-acre park is surrounded by 5 of Boston’s most popular streets that form a pentagon around it: Tremont, Park, Beacon, Charles, and Boylston Streets. 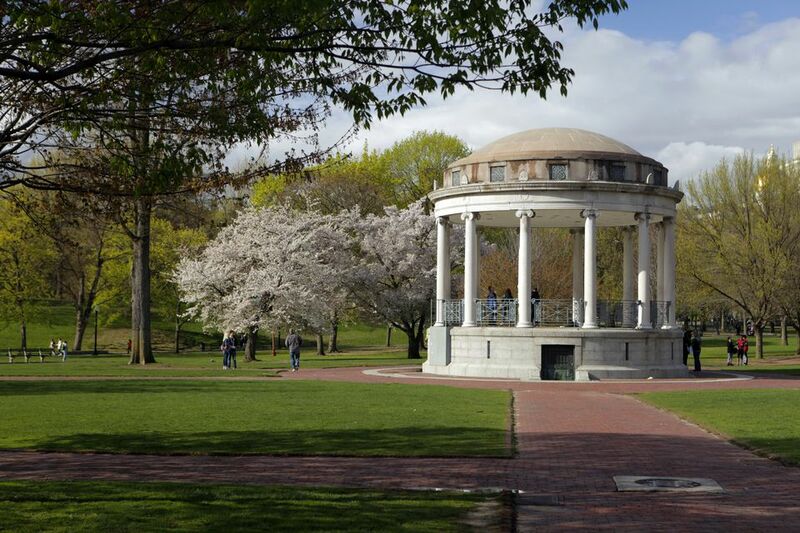 Being so central in the city of Boston, the Common has seen quite a bit of American history, from Colonial times to today. It’s been everything from the site of executions and sermons to a military training field. It wasn’t until the 19th century when tree-lined paths were created, which were then followed by the addition of monuments and fountains after the Civil War. And then after that, over time, there came all sorts of events, sports, rallies, and protests of all sizes. Aside from simply strolling through the Boston Common and taking in the park’s beautiful scenery, or attending various events that take place throughout the year, there are plenty of things to check out while visiting at anytime of the year. Dog owners know there’s nothing better than a nice greenway to let your four-legged friends run free, but that can be tough to find in the city. If you’re a dog owner living in the city or traveling with your pup, you’ll love the Boston Common’s off-leash dog program, the Common Canine. It’s been around since 2013 and is the first approved off-leash area in a non-fenced city park, truly giving dogs the chance to stretch their legs. Frog Pond: The most popular landmark in the Boston Common is Frog Pond, which visitors flock to year-round for various activities. In the winter, the pond is an ice skating rink with a skating school, in the spring and fall it becomes reflecting pool, and in the summer months the kids can enjoy the summer spray pool and carousel. This is another great spot to enjoy lunch in the park, so don’t forget to bring a blanket if you want to go for a picnic. If you’re into yoga, check out the free classes offered during warm weather months. Brewer Fountain Plaza: Right along one of the corners of the Boston Common near Park Street Station on the MBTA, it's reachable by the Red and Green Lines. From April through November, plan to grab lunch at one of the rotating food trucks stationed in the Plaza, which sets up shop at 11 a.m. with some even staying open through dinner. There are plenty of tables, chairs and umbrellas to enjoy a bite to eat at, and you may even catch a weekday lunchtime piano performance by students from the nearby Berklee College of Music. Duckling Day: One of the biggest events in the Boston Common is the annual “Duckling Day,” a 30-year tradition that takes place on Mother’s Day. There you can take part in a parade and celebration of the “Make Way for Ducklings” children’s book, for which there are also duckling statues in the nearby Public Garden. The parade is led by the Harvard Marching Band and there are usually over 1,000 people taking part in the fun day, which also features activities for the kids including crafts, face paint and a magician. Visit the Botanic Garden: Right next to the Boston Common is the Boston Public Garden, America’s first public botanical garden. It’s here you can take a ride on the iconic Swan Boats, a must for anyone visiting Boston for the first time. You can also check out the free 60-minute Untold Stories of the Public Garden guided walking tour and learn all about the Public Garden. Walk the Freedom Trail: The Boston Common is the best place to pick up the Freedom Trail, a 2.5 mile walk through many historic, Revolutionary-era landmarks within the city, including the Paul Revere House, Faneuil Hall and the Old North Church. If you walk at a leisurely pace and stop to check everything out, you should be able to tackle the trail in 3 or so hours. Go shopping: Walk toward Back Bay, where you’ll find the popular Newbury and Boylston Street, both lined with every retailer you could possibly want to stop in. Here you’ll also find plenty of restaurants for breakfast, lunch and dinner, many of which have outdoor seating to not only enjoy the weather when it’s nice out, but also make for great people watching. Stroll the Streets: Another nearby neighborhood that’s picturesque—especially on Acorn Street, one of the most photographed streets—is Beacon Hill. Walking through there will bring you through hills and narrow streets lined with beautiful brownstones.